For more information on our window cleaning, get in touch with us. Either send an online request or call 020 3746 1366 now. Our estimates are non-binding and free. Thewindow cleaning service is deep cleaning of windows, using purified squeegee for internal window cleaning method and water and fed pole cleaning for external window cleaning. 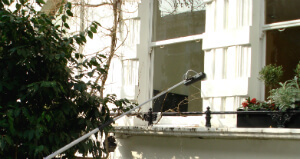 Our thorough and deep Teddington TW1 domestic window cleaning service involves not only secured window cleaning, but in addition cleaning of almost all frames, if PVC, wiping of all sills, if reachable, too. We guarantee fast result and insurance in case of any omission. Key pick-up and delivery can be arranged, for those who have no chance to remain in the property or home during the procedure. All type of domestic properties are accepted. Owners of private and business properties in the area know that regular and proper gutter cleaning can save them a lot of problems and the need for repairs in case water damage occurs because of clogged gutters. Ashlee House Cleaning will help get your gutters clean safely and efficiently, at an good price. Our gutter cleaners use professional powerful vacuum cleaner with telescopic pipes to access your downpipes and gutters and clean them without the use of ladders. These pipes have cameras, so that all debris and dirt is visible. We can give you before and after photos of your gutters. This service comes with a quality guarantee of 30 days. In case your gutters get clogged during that time we will clean them again. We have well-trained roof cleaners who can provide high quality house roof cleaning. Pressure washing equipment is applied to rip out algae, mildew, mould, ugly stains as well as any moss from roofs. Your roof needs to be effectively cleaned out on a regular basis, so that your residence looks great, and so that no damage will develop due to debris and all the other harmful clumps on it. The trouble with microorganisms which dwell on your roof is that they may “eat off” the roof if left neglected for long. Our company delivers a reliable and cost-effective roof cleaning service, which will save you the difficulties of having to go up on your roof or on a ladder to carry out the cleaning your self. Stay safe, and request our completely insured cleaning service right now. For a professional cleaning of any kind of windows, gutters and roofs, do not be reluctant to call us now! Because we care about our clientele, we have developed a very simplified and easy booking system for our window cleaning Teddington TW1 and for our other services. You can get a free price offer or schedule an appointment with our professional window cleaners by just calling 020 3746 1366 or filling out the online booking request form. The client support staff is available 24/7. You will receive an e-mail and a SMS confirming your reservation within two hours of your request. Pick every day of the year for making your reservation with us. We have fair rates. No upfront payment is needed for scheduling this service. If you are booking early on or are a frequent client, we will offer you our beneficial price for that one and several other services. Estate agencies and property managers also get lower price offers. Save money and time and leave it to our professional cleaners to efficiently clean your gutters, windows, roofs - order our top quality cleaning service now!